You are here: Home / Blog / Blog / Guess who is coming to the wedding? Could it be beer packing Burros? Guess who is coming to the wedding? Could it be beer packing Burros? Miniature Donkeys are such a big part of Old Glory Ranch as we have over 30 of them grazing peacefully in our pastures. The mini burros have been part of the landscape at OGR and an integral part of our events since we opened in 1997! Many times, people come to Old Glory because they have seen the donkeys online or heard about them from friends. These little charmers are not always the first thought of a newly engaged couple as they begin compiling the guest list. However, beer burros are a wonderful novelty to add to your special day! 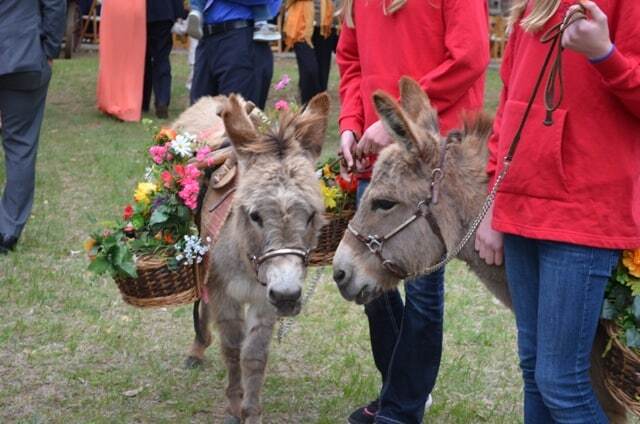 As you are planning who to invite to your wedding at Old Glory Ranch, don’t forget the most sought after guests… miniature donkeys. Frequently, couples think the children at the wedding will adore the donkeys, but your adult guests will love these beer packing burros just as much. There is little else that is as unique as miniature donkeys serving bottled beer, juice boxes or bottled water during cocktail hour. They create a bond with your guests to help them begin those initial conversations, as two families become one. The donkeys are also an icebreaker at corporate events or private parties, creating a more relaxed atmosphere. For more information about our donkeys, how to incorporate them into your Old Glory event or to purchase purchase your very own, visit our Miniature Donkeys page. https://oldgloryranch.com/wp-content/uploads/2014/11/logo-400px.png 0 0 Gina McClure https://oldgloryranch.com/wp-content/uploads/2014/11/logo-400px.png Gina McClure2017-06-06 12:12:462019-01-09 16:24:18Guess who is coming to the wedding? Could it be beer packing Burros?